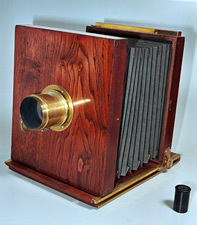 Camera cognoscenti will know (and others may or may not want to know) that in Britain, broadly speaking, two major designs of Wood and Brass plate cameras, the 'Tailboard' and the 'English Style', evolved into everyday use, following after the very early, but soon obsolete, fixed-box and sliding-box cameras of the circa. 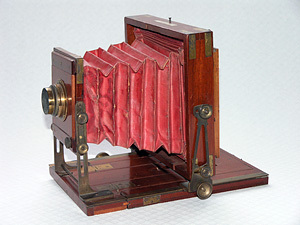 1840-50s, which are now so rare as to be beyond the reach of the average collector. 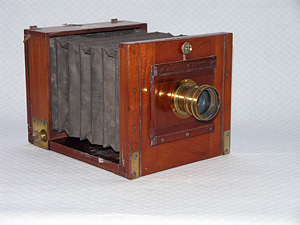 The capability of the camera to fold into a more compact form than a rigid box, or to have more extension than a rack-and-pinion lens could give, was valued from quite early in photography. 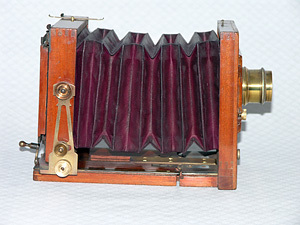 It was this ability which shaped the two styles of camera presented here, once the concept of a bellows connecting the front to the back of a camera was admitted, for practical purposes in the 1850-60s. 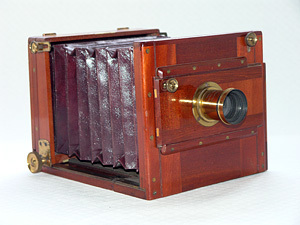 The 'Tailboard' style, with a fixed panel carrying the lens at the front, normally had parallel bellows and a moveable panel carrying the sensitive plate or film at the rear. 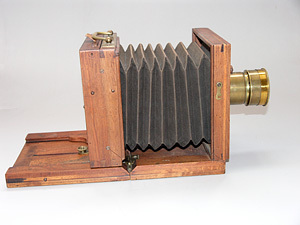 This was usually, but not invariably, on a rack and pinion, or an endless screw arrangement, with a crank handle at the rear for focusing. 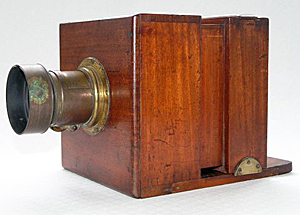 The 'Tailboard' was the earlier of the two styles but, because it was a good design for close-up photography, some makers went on producing cameras in this style for many years after it became unfashionable, and therefore dating them can be difficult. 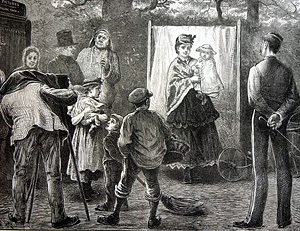 The 'English' style is so called because the majority were made in England, broadly after circa. 1856, broadly to a pattern designed by C.G.H. Kinnear and broadly adopted/adapted by many leading makers. Note the broadlies; you can't be too didactic in this field. Too many variables. This basic 'English' form was improved and developed after circa.1884 by Samuel D. McKellen, a Manchester watchmaker turned camera designer and patentee. 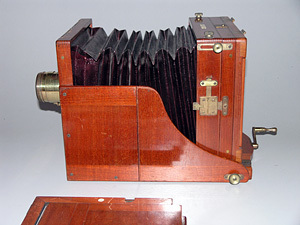 His improved type usually had taper bellows, a drop baseboard, a fixed rear panel carrying the plate, and a front panel carrying the lens, so arranged as to be moved forwards and backwards for focusing, which again was usually, but not always, by a rack and pinion focusing mechanism. So, 'English' here refers to a style of construction, rather than a nationality, although the two often co-incide. But American, French and German makers also sometimes used the 'English' style, so things can get quite complicated, making identification tricky. 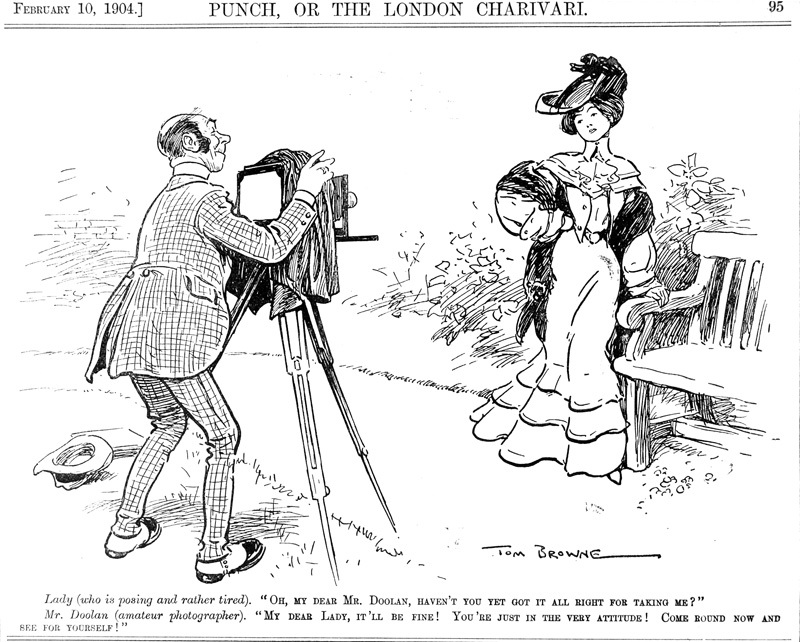 Both Tailboard and English types normally had to be used on a tripod. 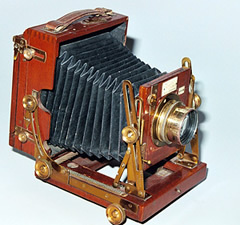 The lens showed an upside down image on a ground glass plate at the back, for focusing, and the operator often had to put his head under a black cloth to make the image on the screen visible, by cutting out extraneous light. 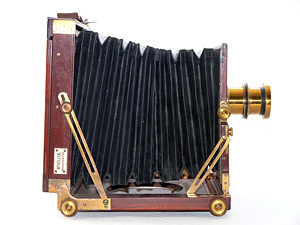 Further to complicate matters, some makers produced what I have called 'Hybrid' styles, where their cameras did not obligingly fall into either of the above categories, but showed characteristics of both styles. 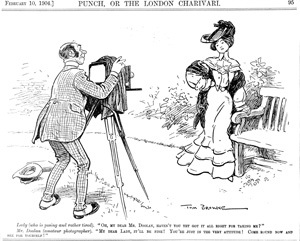 And then there were the 'Press' cameras, the 'Hand and Stand' cameras, and the 'Strut Folding' cameras, where 'English' in the description MAY be taken to refer to their place of origin. Where such deviations occur, I have tried to include them in the two broad categories 'Tailboard' and 'English', and to explain in their descriptions what is going on. If you are with me as far as this, thanks and congratulations. You are a person of character. It gets no worse from here on.